But in searching for that symbol, which I had no idea what it is called I came across the story of it. Recently in reading one of a fellow blogger’s post, spouting some theist rhetoric equating faith as being a plausible substitute where uncertainty exists, it reminded of the story of the Eye of Horus. Long story short, the myth involves Horus and Set (in some accounts are brothers, in some nephew and uncle respectively). Set kills Osiris (Horus’ father) and in revenge Horus kills Set, but in that battle Horus is injured. Set struck at the eye of Horus shattering it. As luck would have it the eye is broken into a fun set of mathematically progressive pieces. The symbol of the Eye of Horus is drawn with 6 strokes, each stroke represents what they believed were the 6 senses: sight, hearing, touch, taste, smell, and thought. This shattered eye is broken into 6 pieces in specific proportions: 1/2, 1/4, 1/8, 1/16, 1/32, 1/64. 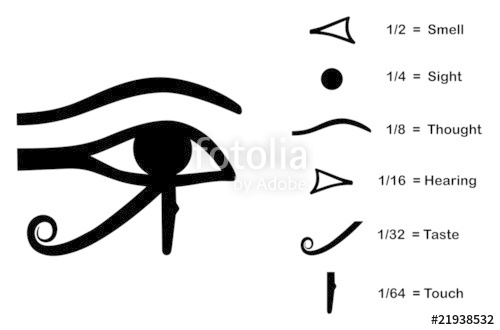 Horus took the pieces of his eye to a local magician to reassemble the eye, but if you do the math, you will of course discover that you are 1/64th short of a whole eye. This magician had to use ‘magic’ to fill in what was missing. This was the left eye of Horus, which represents the moon, and is why the moon is supposedly more mysterious (because part of the eye was reconstructed with magic). The right eye of Horus represents the sun, and this became the more common eye used later in Egyptian culture as a symbol of protection. Anyway, where I am going with all this is that it seems to me that our human uncomfortability with uncertainty is what drives us to put faith into the missing picture. You have something that is a whole, you only understand a part of it, and the other part you fill in with faith, instead of remaining uncertain. This seems hardly surprising to me. What it does feel like to me is that as we learn more about any particular thing the proportion of what we don’t know gets smaller and smaller. The God of the Gaps has less of a Gap to cover, and yet we want to give that magic the same level of importance. We can go from no idea of our origin, to a very substantial set of empirical evidence about evolution, but no matter how little uncertainty remains it seems magic must still prevail as long as any proportion still remains.